I’m always searching for ways to illustrate concepts using “simple” analytical examples (I’ll let you decide whether or not this example is simple). Today, I present analytical examples of frequency and phase encoding during magnetic resonance imaging. 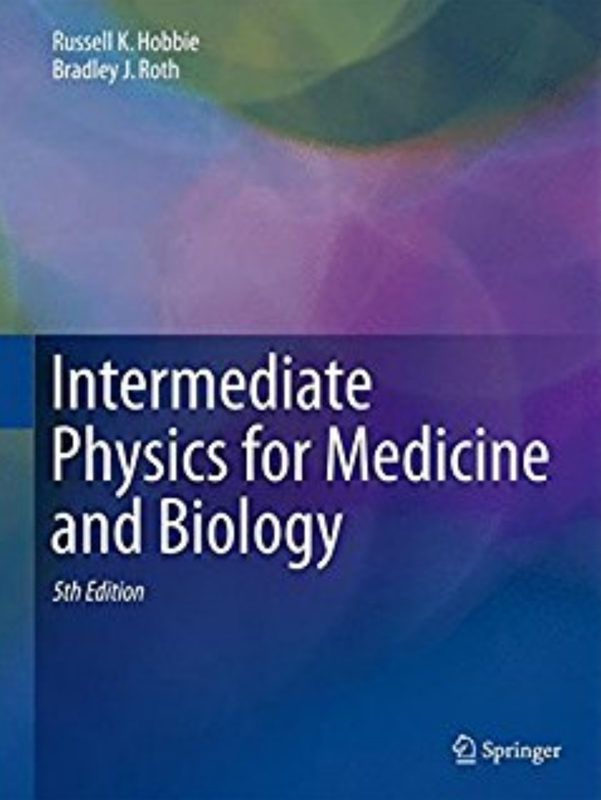 Russ Hobbie and I discuss MRI in Chapter 18 of Intermediate Physics for Medicine and Biology. The radio-frequency π/2 and π pulses, used to rotate the spins into the x-y plane and then create an echo, are so brief that the spins rotate instantaneously compared to all other time scales. 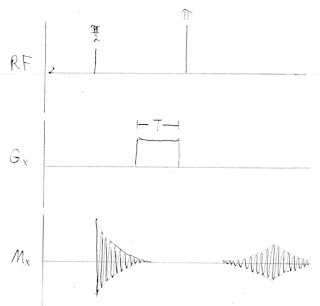 Similarly, any slice selection gradient Gz = dBz/dz exists only during the radio-frequency pulses. We won’t include Gz in our drawings of pulse sequences. We ignore relaxation, so the longitudinal and transverse time constants T1 and T2 are infinite. The peak frequency ωo is the Larmor frequency equal to γBo, where γ is the gyromagnetic ratio and Bo is the main magnetic field. The time constant τ indicates the width of the frequency distribution. The spins are distributed uniformly along the x axis from -Δx to +Δx. 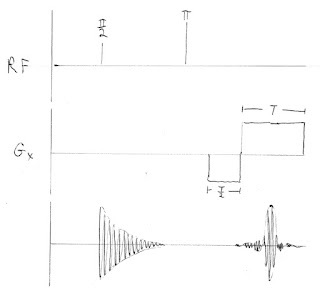 The spin-echo pulse sequence, with no gradients and no frequency or phase encoding, is similar to Fig. 18.24 in IPMB. Our pulse sequences consist of three functions of time. The radio-frequency (RF) pulses are shown on the first line; the time between the π/2 and π pulses is TE/2. The magnetic field gradient in the x direction, Gx = dBz/dx, is indicated in the second line; for this first example Gx is zero. 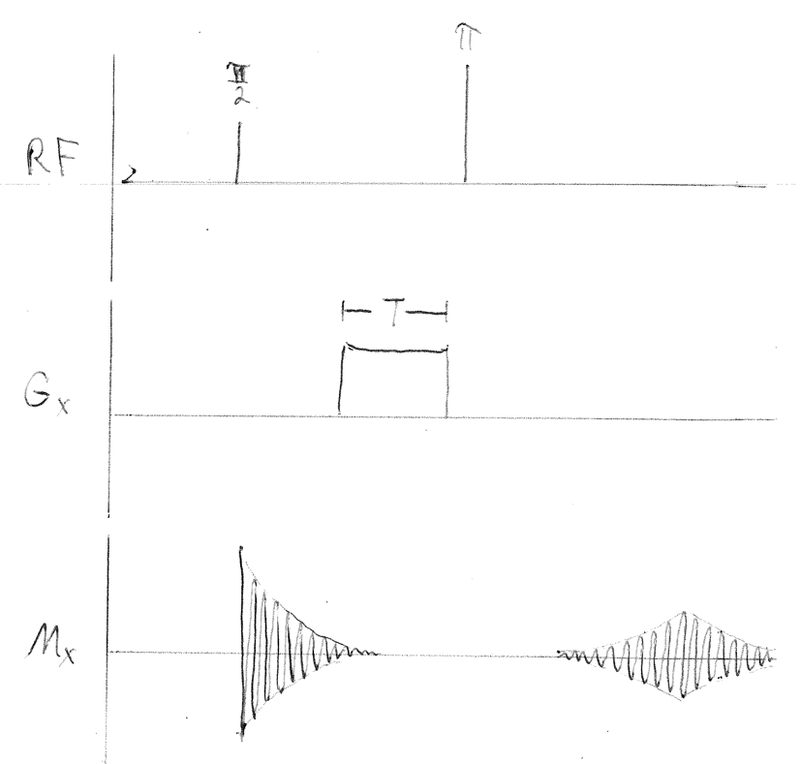 The recorded signal, Mx, is in the third line. where τ corresponds to T2*. The exponential shape of the free induction decay arises from the particular form of our spin distribution. The wider the distribution of frequencies, the faster the decay. which peaks at t = TE and decays with time constant τ. Phase encoding adds a gradient field Gx of duration T between the radio-frequency π/2 and π pulses. It shifts the phase of the spins by different amounts at different x locations (thus, position information is encoded in the phase of the signal). This phase shift is then reversed by the π pulse. 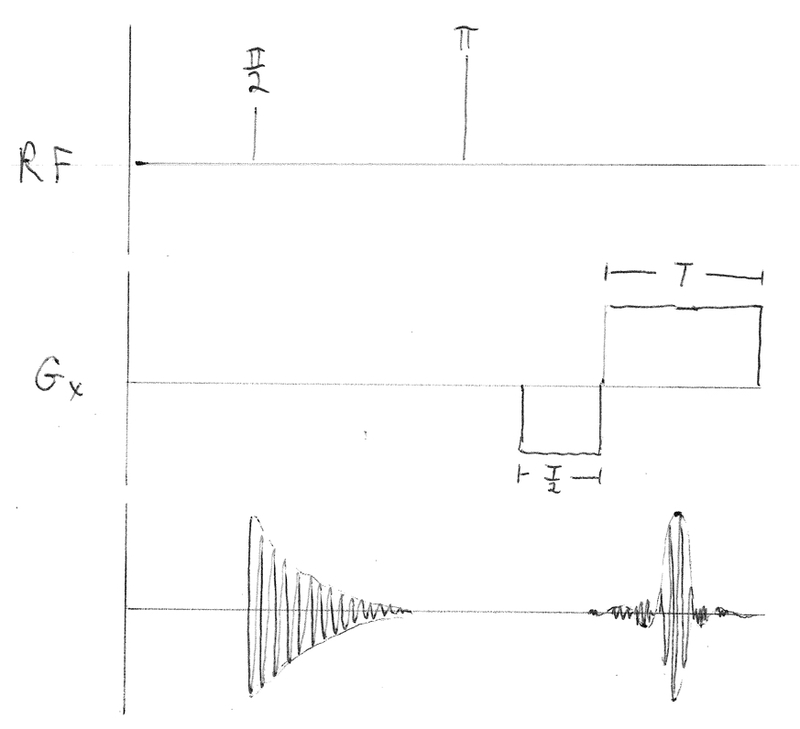 The amplitude of the echo depends on the factor sin(γGxΔxT)/ (γGxΔxT). For a Gx of zero this factor is one and the result is the same as for the spin-echo. If we repeat this pulse sequence with different values of Gx and measure the amplitude of each echo, we can trace out the function sin(γGxΔxT)/ (γGxΔxT), which is the Fourier transform of the spin distribution as a function of position. To do frequency encoding, we add a readout gradient Gx that is on during the echo and lasts a time T, like in Fig. 18.26 of IPMB. In addition, we include a prepulse of opposite polarity and half duration just before the readout, to cancel any extra phase shift accumulated during the echo. (Russ and I discuss this extra lobe of the Gx pulse when analyzing Fig. 18.29c, but we get its sign wrong). 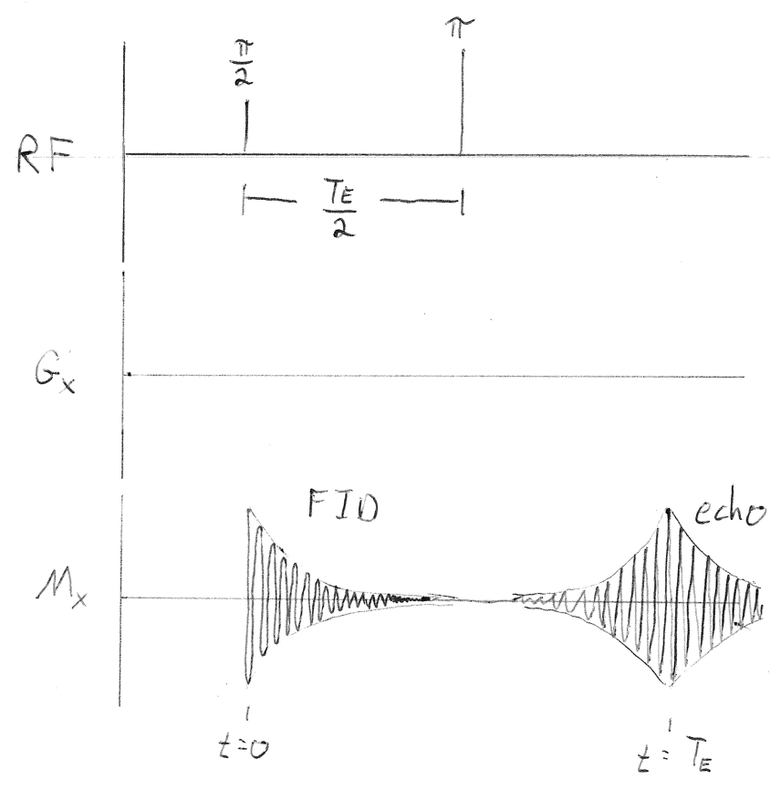 The envelope of the echo is the product of two terms, which are both functions of time: An exponential e-|t-TE|/τ that has the shape of the echo with no gradient, and a factor sin(γGxΔx(t-TE))/ (γGxΔx(t-TE)). 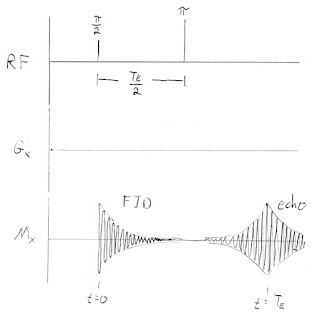 The amplitude of the echo at t=TE is the same as if Gx were zero, but the shape of the echo has changed because of the time-dependent factor containing the gradient. The function containing the sine is the Fourier transform of the spin distribution. Therefore, the extra time-dependent modulation of the echo by Gx contains information about the spatial distribution of spins. What do we learn from this example? A phase-encoding gradient changes the amplitude of the echo but not its shape. A frequency-encoding gradient, on the other hand, changes the shape but not the amplitude. Both can be written as a modulated Larmor-frequency signal. In the pulse sequences shown above, the Larmor frequency is drawn too low in order to make the figure clearer. In fact, the Larmor frequencies in MRI are many megahertz, and thousands of oscillations occur during the free induction decay and echo. I analyzed both phase encoding and frequency encoding in the x direction and considered each individually, because I wanted to compare and contrast their behavior. In practice, frequency encoding is performed using a Gx gradient in the x direction and phase encoding with a Gy gradient in the y direction, mapping out the two-dimensional Fourier transform of the spin distribution (see IPMB for more). Until I did this calculation I never completely understood what the shape of the echo looks like during readout. I hope it helps you as much as it helped me. Enjoy!